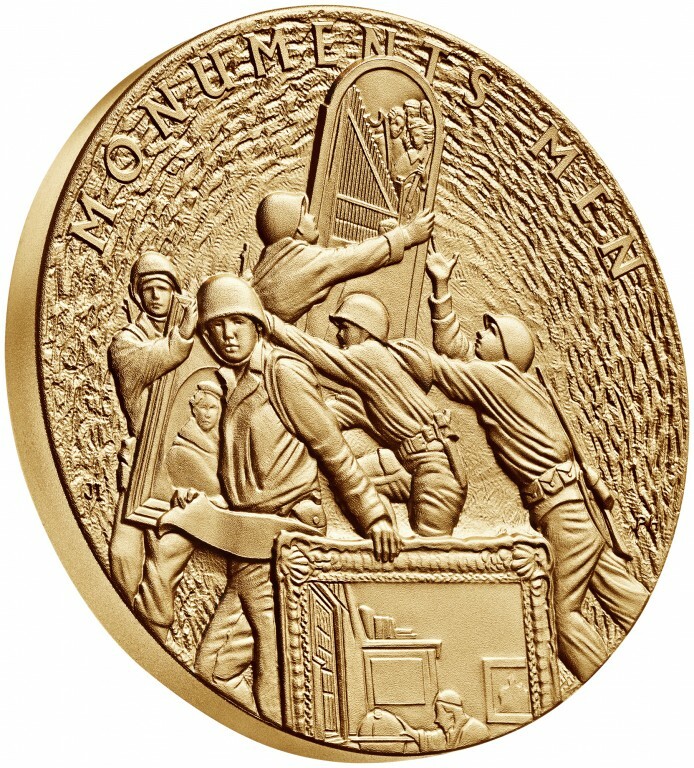 This medal is a bronze replica of the Congressional Gold Medal presented to the Monuments Men in recognition of their heroic role in the preservation, protection and restitution of monuments, works of art, and artifacts of cultural importance during and following World War II. 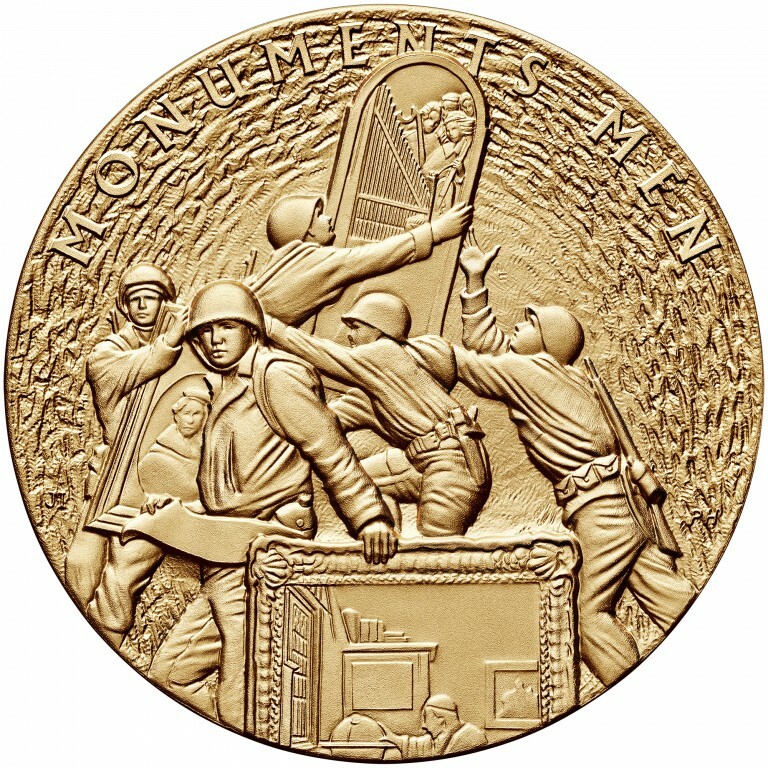 “Monuments Men” was the name given to the men and women who served in the Monuments, Fine Arts, and Archives section under the Allied Armies. 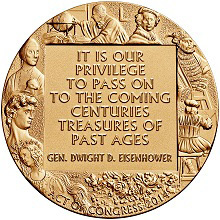 Initially, the group was tasked with protecting and temporarily repairing the monuments, churches and cathedrals of Europe that were damaged due to combat. 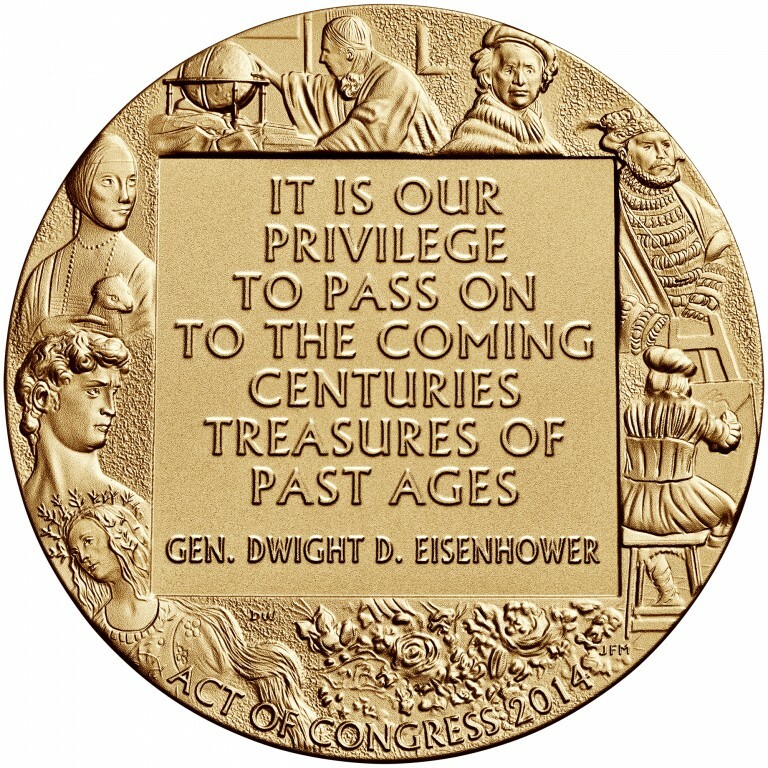 However, their mission was adapted to identify, preserve, catalogue, and repatriate almost 5,000,000 artistic and cultural items during and following World War II. The Monuments Men saved and recovered some of the world’s most famous pieces of art by such renowned artists as Michelangelo, Johannes Vermeer, Jan van Eyck, Vincent van Gogh, Rembrandt and Leonardo da Vinci. 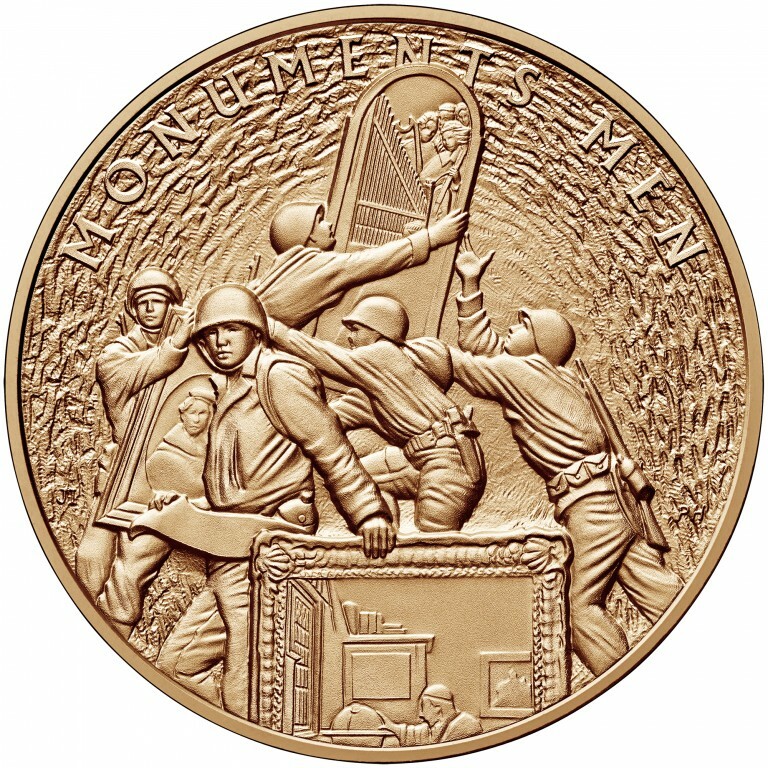 The obverse (heads side) design is a portrayal of soldiers in action, lifting and removing objects from a cave or mine location where Monuments Men discovered stolen works. 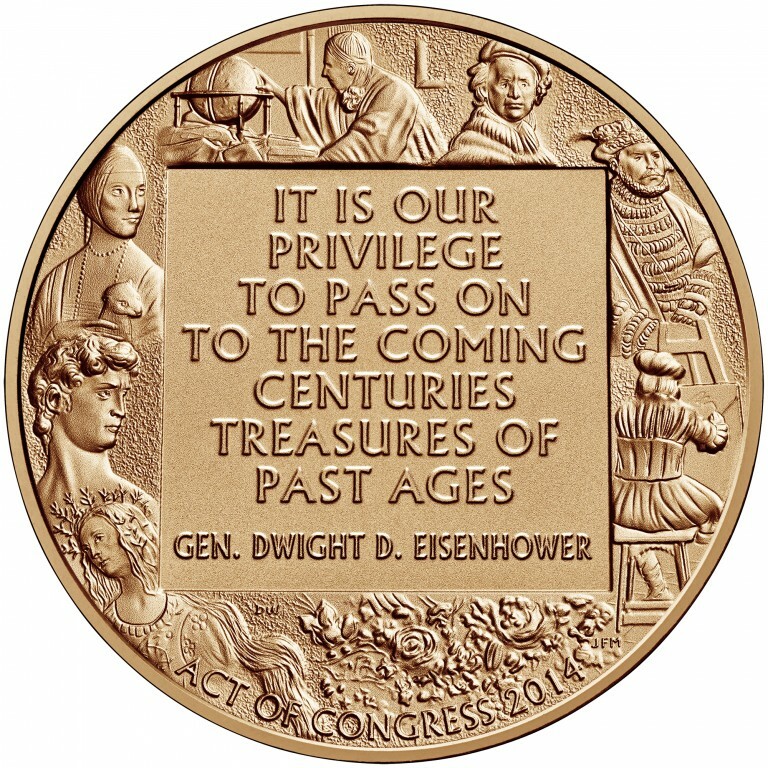 The artwork depicted represents major works of historic significance the group recovered. 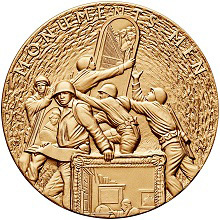 The reverse (tails side) design features some of the thousands of works of art that were at risk from damage, destruction, or theft by Nazi forces.